The world that Milena creates is close and personal, she grabs it and makes it unquestionably hers making magic where things seams what it is not and vise-versa. Within that contrasting game, the artist rearranges it to make reality and imagination coexist. Milena is from Havana, better, from the Center of Havana, even closer from San Jose & Aguila streets, a highly populated area where communication happens between balconies and the street is a swarm of people. She lives were the funk and sonorities brake the architectural silence of her paintings, to inject life to her creation. Moving the focus to Old Havana, the images hold an infinite range of ages, sexes and races. The multiple and transcultural city that make Yemayá, the deity, the center of a carnival. In Milena’s paintings, some wait, some sell, other dream, play or talk, in a compendium “costumbrista” of intense variety, seemingly reviving romantic mannerisms now reveled though strong and contrasting shades: “the old” as a pretense, the historic colonial environment recreated by the creative mind. The beautiful, recently restored, parts of Havana and the parts waiting to get over the ongoing decline, reappear visually revitalized as a architectonic paradise in a way with pastel colors and blossomed balconies. Within this setting of “old-new” “real-imaginary”, everyday scenes adopt a peculiar picturesque site, contrasting and satirical. 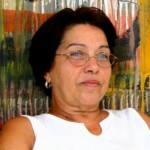 Milena finds in the popular all the wisdom and with it, moves aside her academic technicality to freely manage composition and color, and is in that capacity where her work converge with the most native of cuban culture to reach a high artistic value. Space and time are the code for culturologic contradictions, historical, actual, imaginary, and factual. The present time, stopped by fabulation and description. Festivities, conflicts and hopes are used to spice up Havana, and is in the image re-designed, that what is known become new and different, where lies the charm of these paintings. Within the searching eye of the artist there is a sociological approach and critical stance. The city is not a stage, nor it’s people actors, even though they inter-act as in a theatrical play, and is in the semantic of that “theatricality” where the artist emerges, without pessimisms and nostalgics and creates out of the real world her own imaginary and personal one, with its own shades and other contrasts.